We set off into a humid, threatening morning. Within an hour it had become so threatening that we stopped in a layby to put waterproofs on. Minutes later, as we waited to turn right at a T junction, jagged lightning lit the black sky ahead and a sinister boom of thunder echoed round us. For the next few minutes, the rain was the kind that bounces back up off the ground and runs across the road in streams. But on a warm day, tucked up in waterproofs, slogging through it in a group was a cosy and companionable experience. A long, hot stretch followed. This was Gascony, where the town names end in -ac. Few junctions meant few markers to collect, and I travelled alone. 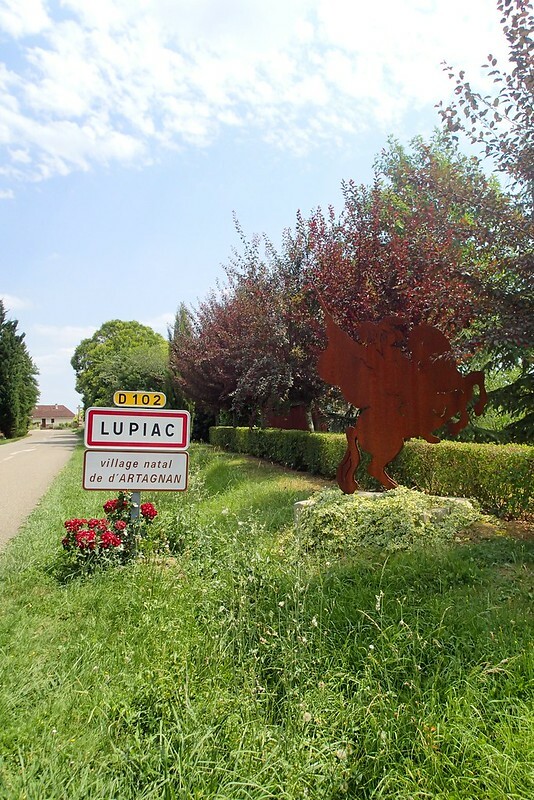 I stopped to photograph d'Artagnan's birthplace, Lupiac (the real-life d'Artagnan; the one in the novel was born in Béarn, of course), and again to wipe the yellow remains of an enormous insect, the type known in biking circles as a ‘custard fly’, off my glasses. At the eventual, welcome tea stop, a French gentleman examined the bikes, lined up in the town square, and asked me about mine. We had a conversation in Franglais about mileage, then it was time to depart. Seeing the aeroplane keyring I'd bought several days and hundreds of miles ago, my new friend observed "Your bike is solid, like the Dakota!" We approached Lourdes through flatlands, past kites circling on the thermals, and entered the old town, along the river, where the hotels are named after saints. We had been under the impression, the previous day, that Rocamadour was a bit on the tacky and touristy side. To which Lourdes, in Twitter parlance, said 'hold my beer'. I was pretty tempted to buy a plastic water bottle shaped like the Virgin Mary, but I resisted. I have a small plastic Virgin Mary water bottle containing eau de la grotte! Despite not being a Catholic. Dunoon was twinned with Lourdes, so my French exchange trip from school was to Lourdes. Yes, it's tacky, but it's a great place for an exchange. I felt sorry for the poor French kids coming to a wee back corner of Scotland. I think my favourite bits of Lourdes were the model village, the funiculaire, and Le Gouffre de Lourdes at the top of the cable car. From a bit of Googling it looks like the cable car closed in the 1990s and "Le Gouffre" is also closed and unsafe, but it was a small cave in which they'd found (and displayed) evidence of early human habitation. It was looked after by a nice old bloke whose French was barely comprehensible to Scottish book-larnin', but we managed. Oh, it's a shame I missed all those things - I love a cable car (though we did get a go on one in Spain later). Custard fly.. ewww. ^_^; Must be rather distracting, surely, when something like that smacks against your visor. There is indeed something quite special about French bars/cafes, not to mention the whole pavement cafe culture, where I suppose the UK can significantly blame the often drab weather. And tapas bars, yay! I so wish they were more of a Thing hereabouts, especially independent joints, not just just chains like La Tasca (Zizzi, Nando’s, etc etc). Yes, and the culture of buying a pastry elsewhere and eating it in a bar with a nice coffee. And shops being open late. Still no desire to move, though! Flies on the visor are a little distracting, but nothing has ever been as bad as the time a wasp flew in (and, fortunately, out again).